My beer stocks are getting alarmingly low. All of the ‘drink these before they start going stale’ beers have been drunk, leaving just my range of bottles that I’m claiming I’m maturing but am probably subconciously keeping due to being a hoarding collector of stuff. Amongst these are a couple that I picked up on my Scottish trip back in February, including some from the folks at the Black Isle brewery. Awesome chauffeur Jon and I popped in while he was showing off how much nicer than London the countryside around his bar in Drumnadrochit is (quite a lot nicer, although there’s not as many 24 hour shops) and after a quick tour (it’s all in one room – it was a very quick tour) I filled the remaining gaps in my bag with two bottles from their shelves. 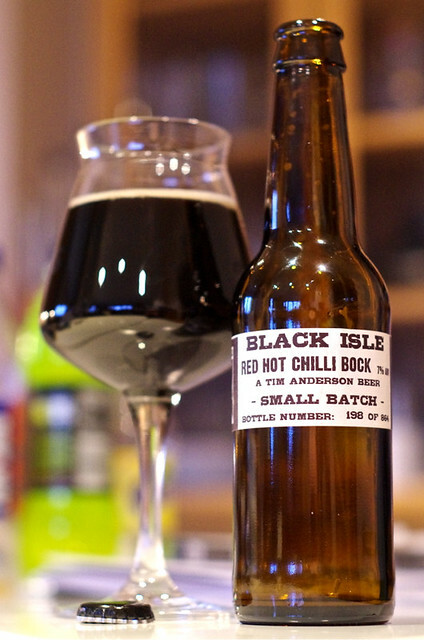 The other night I was looking for a swift half to tide me over before bedtime and went for a bottle of Black Isle Red Hot Chilli Bock. The brewery opened in 1998 and a couple of years back moved to a new location with a bit more space (and a farm) – I’ve seen leaflets advertising their beer shop and brewery tours since they opened but had never been able to convince any of my previous chauffeurs to drive me over. They are named for the Black Isle, where they sit, and produce a range of organic beers that I’ve been a fan of for a while, mainly in the form of drinking Yellowhammer at the Great British Beer Festival every year. They’ve got their own bottling line and you can find their wares in a variety of specialist beer shops as well as in Royal Mile Whiskies (at least in London), my main source for non-festival Yellowhammer. This beer was brewed in conjunction with Tim Anderson, former boss at the Euston Tap, BrewDog pizza and burger king, and winner of Masterchef 2011. From what I can gather the beer’s got some smoked malt in as well as some chilli, but other than that I can’t find a lot. It’s a totally opaque black beer with some bitter dark chocolate and sweet milk chocolate on the nose, along with a chilli tingle at the back of the palate if you snort at it for a while. To taste it’s quite thin (definitely more bock than stout) with CO2 sourness, coffee bitterness, some of the chocolate mix from the nose, a bit of malty sweetness, a dry mineral edge, and a hint of chilli flavour and spice. It finishes with damp coffee grounds, damp bark and a slowly building chilli spice. It’s also a 7% beer which shocked me – it doesn’t have much body and you don’t really detect the alcohol, which suggests potential danger if you have a few of them lying around. I’m not usually a fan of chilli beer, usually finding them too spicy or having no chilli at all and this sat at just about the right point for me – enough to let you know it’s there, add flavour and interest, but not enough to make drinking the beer a chore. However, it felt a bit thin and dry, and a bit more malt sweetness and body wouldn’t have gone amiss. All in all – not bad, although maybe one to have with dinner rather than as a nightcap.